A Hackerspace is defined as a location where hacker minded individuals can gather to share interests, typically in science, mathematics, electronics, art, and/or crafting. Hackerspaces are as unique as the cities they are located in. No two spaces are alike. 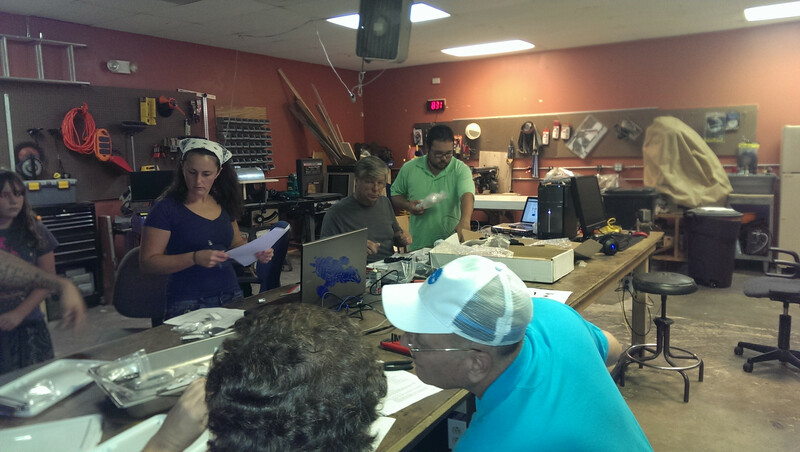 Often referred to as a makerspace, hackerspaces are often hard to describe. Our vision for what we want our Hackerspace to be is a community operated hackerspace to support member projects, and to provide a member accessible workshop. Everyone has their own goals for the group but these seem to be the recurring ones. Find people who like to create things, share ideas, and collaborate with. Educate and inform others who would like to know how to do some of these kinds of projects. Our hackerspace is largely member driven. The vast majority of the decisions for the organization remains in the members hands. It shall remain the exception to the rule rather than the norm that decisions are left completely in the hands of the board members. We hope that with the organization remaining member run people will have a sense of ownership and pull within the group’s actions. Officially we are utilizing a board of directors structure. We have, but do not limit ourselves to, a President, Vice-President, Secretary, Treasurer, Public Relations Director, and a Sergeant at Arms. This is purely for the day to day business aspect of the group. Since we are an incorporated entity (we are currently a mutual nonprofit) we need certain positions in place and names to go on the official paperwork. The purpose of the board is specifically not tell individuals in the group what to do, but to keep these members within the realm of reality. To also keep fresh minds with new ideas in place, there will be a yearly voting process at which point new officers are elected. Check the contact page for the current board members and means of getting in touch with them. We started as a group of people online with a common idea. We had all heard about the idea of “hackerspaces” or “makerspaces” where geeks could come and work on projects together. Coming to the realization that Memphis and the surrounding area has no such group, we decided it was time for one to exist. We joined forces for the first time as a group on January 8th, 2010. It was at this first gathering that we decided on the name Midsouth Makers and thus incorporated it within the state of Tennessee. While waiting for that paperwork to come back we were sent a bit of inspiration in the form of a visit from some Pumping Station: One members. It was from the encouragement of these visitors that we decided to hold weekly meetings. Those meetings were likely the singular best thing we could have done yet. Since then the meetings have continued to grow in size almost to the point of bursting. Along with our paramount growth we have acquired a tax ID and a bank account to operate with! In December 2010, barely a year after founding our group, we moved into our first physical location at 2203 Freemont Rd. Memphis, TN 38114. Since then we have continued to work towards group and individual projects. We have a nice array of tools in our shared shop space as well as the foundations of a member donated library with various tech manuals and books. We have our very own server room that members are welcome to add to and we’re in the planning stages of expanding to a digital library. We have been fortunate in donations by various people, groups, and corporations in the Memphis area. As of July 2012, we relocated to a shop in the heart of Bartlett, TN. Our current address is 2804 Bartlett Rd Ste #3, Memphis, TN 38134. As we grew in number and gained experience in playing host to a hackerspace and its rather unique challenges (not to mention its rather unique members), we sought a space that would better serve our members and reach more potential Makers. While our infancy on Freemont will be fondly remembered, our home in Bartlett is geared to support us as we continue to grow and build cool things. The entire space is indoors and air-conditioned, with the garage door and ‘shop’ area able to be isolated from the rest for comfort. We are located immediately next to the spacious W.J. Freeman Park, offering potential opportunities for aircraft, activities, or spousal/spawn distraction. We are also central to many fine eateries, entertainment venues, and it doesn’t hurt to have a Radio Shack 30 seconds’ away.